Facebook, Instagram, Snapchat, Twitter – all common platforms that many of us are registered with and avid users of. The simplicity of each platform encourages users to upload brief snippets of information as and when they feel the need to update – whether it’s a new restaurant they tried, a new phone cover or a quick holiday getaway. Are you someone who is proud of your health achievements and how far you've managed to run today? What about breaking your personal record of what you managed to lift at the gym? If you are, cybercriminals may already have the approximate location of your house, the path you take for running and your health regime. These days it’s also becoming increasingly common for people to post holiday bookings, including the dates and locations where they will be. If you are abroad on holiday, criminals may take advantage of an empty house. It is not unheard of to be approached for possible business ventures via professional social platforms such as LinkedIn. Beyond just knowing a person's interests, oversharing can lead to cybercriminals building a profile on you that could eventually lead to being used against you as a scam. Financial scams are not new and can cost budding entrepreneurs large sums of money if they are not careful. 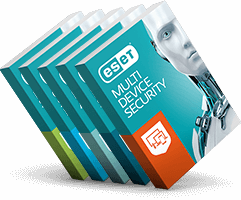 21% of Singaporean respondents from the ESET 2018 APAC Consumer Survey indicated that they have shared personal information or photos with strangers via social media platforms. Although this is a lower rate in comparison with other countries, it is still a worrying level of discretion. Personal information can always be used against you or to carry out an elaborate scheme to scam you. 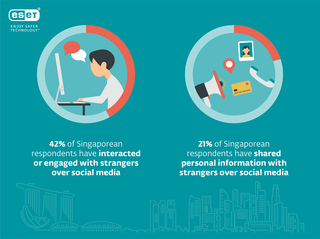 According to the ESET 2018 APAC Consumer Survey, 42% of Singaporean respondents indicated that they interact and engage with strangers on social media. As care-free as this behaviour sounds, it poses the risk of cybercriminals gathering enough information about you to attempt to either steal or duplicate your identity, eventually leading to extortion or blackmail. • Reviewing your post visibility settings before you post something, and think about the consequences it can have upon your life, both personal and professional.